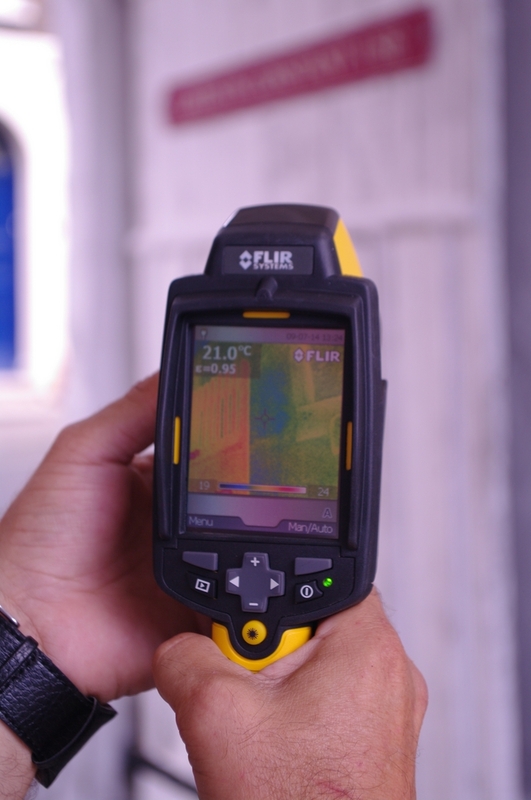 The combination of very cold weather and the introduction of basic heating in my ancient house has provided enough of a contrast between internal and external temperatures over recent months for some useful infrared thermography (IRT). I’ve been very fortunate to have had assistance with this from Mark Hurst of Anglia Ruskin University/1st Associated (www.1stassociated.co.uk). Mark’s FLIR B40 camera detects differences in surface temperature caused by variations in heat flow thorough materials and records the results in the form of a thermal image (thermogram). This offers a convenient, non-destructive method of investigation. It’s helped me not only to pinpoint where most heat is being lost through the building’s fabric but with determining the pattern of timber framing hidden beneath render. 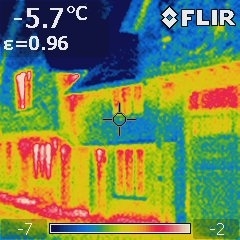 From the IRT camera I now know that the areas associated with the poorest thermal performance include the single-glazed windows and floors of the overhanging upper storeys. These will be addressed during the project but the IRT has also shown that my use of cling film and masking tape as a temporary expedient behind a draughty window is already paying dividends!